The mushroom business in the Philippines is apparently a burgeoning business with enormous commercial potential in as much as it targets a basic need: food. There is also a claim, on the contrary, that its present cultivation in this country is limited, perhaps due to the limited local knowledge about its culture. But at the heart of the Manila metropolis in Boni Avenue is a dynamic and bracing research center of Rizal Technological University that is taming and developing mushrooms in underground passageways. These channels are valued historically where they were used by World War II soldiers to transport themselves inconspicuously to and from adjoining towns from their attack or defense or simply to escape from enemy troops. Finding the tunnels apposite for other purposes has given them modern-day worth. The tunnels are regarded to impact positively and directly to the local mushroom industry. Cultured inside the adobe-made tunnels are edible mushrooms species that grow in semi-temperate areas like Pleurotus sp. (oyster or abalone mushrooms), Auricularia sp. (ear fungi), Agaricus bisporus (tropical white button mushrooms), Volvariela volvacea (rice straw or banana mushrooms), and Lentinus edodes (shiitake or brown or black Japanese mushrooms). Moreover, the culture of medicinal mushrooms is gaining its popularity abroad. “That is why the research center is now starting to cultivate mushrooms which have therapeutic applications”like the Ganoderma lucidum”to parallel our innovation with those in foreign lands,” says Angelita Medalla, a university’s faculty researcher and mushroom specialist. Mushroom growing can be made double in a cooperative where division of labor can be resourcefully practiced. Mushrooms are fungi characterized by the presence of gills under the umbrella-shaped cap called pileus. Some have the presence of rings; others have none. Some grow in mass or in clusters; others develop in singles or in pairs. Others thrive well on cool weather, some in warm places. Like plants, mushrooms have seeds responsible for propagating the species. They produce spores like all fungi. These spores are very diminutive and microscopic that they disperse and disseminate through the air with the wind. When they happen to fall on a suitable agricultural waste, these spores germinate and develop into mycelium. If the conditions are favorable, it continues to grow, ramify and develop into mushrooms. Medalla stresses that edible mushrooms are good sources of high-quality protein. “They can be produced with greater biological efficiency and have an important role in elevating the diet of people enduring from protein deficiency,” she says, adding that they can represent a source of high-value metabolites like anti-tumor or cancer agents. There is also a reason that one of the most cost-effectively practical processes for biocon-version of agricultural and industrial lingo cellulosic wastes is the cultivation of edible mushroom. “This is extremely important in rural areas where there are available large quantities of agricultural wastes ideally suited for growing different types of edible mushrooms,” Medalla exemplifies. Furthermore, the substrate (or agricultural waste) residues that are left after harvesting mushrooms can be converted into feedstock to ruminants and used as soil conditioners. Medalla articulates they can help increase the income in the rural and urban areas, improving the social status of unemployed people. Mushroom cultivation is an income-generating activity that can be done both in rural and urban areas. Mushrooms can be grown on commercial or small scale using either highly urbane equipment or low-cost materials and agricultural wastes. The choice of species and technology, according to Medalla, will depend on the conditions prevailing in the place where one prefers to grow the mushrooms, the availability of the substrate to be used and the availability and amount of capital. Medalla suggests that mushroom growing can be made doable in a cooperative where division of labor can be adroitly practiced. “There is a group that can be engaged in spawn production, substrate preparation, planting or inoculation, fruiting, harvesting, processing and marketing aspects,” she says. Mushroom production is a complicated business. It involves a number of complicated steps and operations like the pure culture preparation (the selection of the acceptable fruiting culture of the mushroom); the planting material preparation; the substrate preparation where mushrooms will be grown; the actual planting or the inoculation of the substrate; and the harvesting, processing and marketing. During the preparation of the culture media, peel and weigh the 200 grams of fresh, hale and hearty potatoes. Dice these potatoes to about two-centimeter cubes. Boil one-liter distilled water and add these diced potatoes. Let them simmer for ten minutes or until they are soft enough to be eaten. Strain off these diced potato through cheesecloth, and restore the volume of the potato decoction (broth) to one liter by simply adding distilled water. Bring the potato decoction to boil, and add 20 grams of agar. Stir the mixture until the agar dissolves. Add 20 grams of dextrose powder and stir until it also dissolves. Pour and distribute 40 to 50 milliliters of the mixture into empty bottles. Plug the mouth of the bottles with cotton, cover with paper, and tie with rubber band. Sterilize them in pressure cooker at 15 pounds for 15 to 20 minutes, and allow the pressure to drop down to zero pounds per square inch. Take out the sterilized culture media, and slant the culture media bottles. Then isolate the pure culture using the tissue culture. This method is done through selecting a young and healthy mushroom that is disinfected with 70 percent alcohol by rubbing a cotton swab. With a sterilized scalpel, cut approximately one-centimeter cube of the tissue and plant on the slanted agar with the use of sterilized forceps or scalpel. Incubate at room temperature for ten to 14 days or until the media is fully impregnated with the mycelia. Wash thoroughly the grains in tap water. Transfer in clean casserole, and add water till one inch above the level of grains. Boil until the grains are about to burst. Cool the grains by spreading in a nylon cloth or line screen and allow the water to drain off leaving the grains just damp (65 to 70 percent moisture). Distribute grains equally in bottles, plug with cotton and cover them with paper or foil, and support them with rubber band. Sterilize at 15 pounds for an hour. Cool the bottles at room temperature; aseptically inoculate with young and vigorous culture of the mushroom mold. Incubate at room temperature until the grains are fully impregnated with the mushroom molds. At the preparation of the composted sawdust medium, mix thoroughly the composted sawdust medium composed of 78 percent sawdust, 20 percent class A rice bran, one percent calcium carbonate or lime and a percent of washed sugar. Add tap water until the mixture attains 65 to 70 percent moisture, which is determined by pressing a handful of mixture in the hand and no water should run off in between fingers and the materials should stay in form after releasing the pressure. Pile the substrate or mixture in a pyramidal form. Cover with plastic sheet for a period of five days with turning every after two days, repiling and returning the plastic cover again. On the fifth day or after the second turning, aerate the piled materials by spreading thinly in a shaded area to remove the toxic gases that may have been produced during the period of composting. After the acidic smell has gone, check and adjust the moisture content making sure that it is 65 to 70 percent. Pack the substrate in not-so-loose-or-not-so-compact bag. Collect the upper part of the bag and pass it through a plastic ring, and pull the plastic ring down thus making the mouth of the bag. Plug each bag with cotton, cover it with paper, and tie with rubber band. Sterilize 15 pounds for an hour and a half, or the bags may be subjected to steaming process. The period of steaming depends on the load of the container. To propagate the mushrooms, transfer the sterilized and cooled bags inside the inoculation room, which has been previously disinfected. Aseptically inoculate each bag with the mother spawn. Transfer the spawned bags in the incubation house, and incubate at 25 to 28 degrees Celcius for a month or until fully impregnated with the mushroom mold. Once the bags are fully ramified, allow them to undergo maturation period by extending incubation by another month. The matured bags are then ready to open. Open the bags carefully by cutting the plastic below the neck, and water them abundantly but carefully. The floor and the walls of the house should also be watered. On the third day, pinheads or primordial will develop. In this case, do not water the bags but the walls and the floor. Harvest period is expected on the fourth and the fifth day and harvesting goes for two to three days. After fruiting, the bags should rest for five to seven days. During rest period, monitor the temperature (25 to 28 degrees Celcius), relative humidity (85 to 90 percent) and moisture (65 to 70 percent). After each rest period, normal flushing or fruiting will follow and the cycle is repeated. The complete fruiting cycle lasts for two to three months. 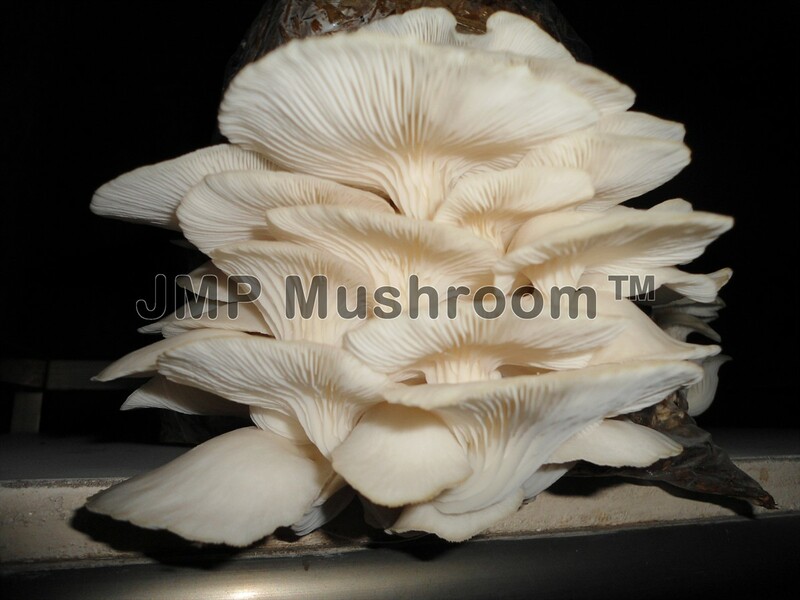 i am very interested to know and learn more about the culture and business potential of mushroom. Will communicate more on this website later. Million thanks. Im interested to learn how tot grow or propagate mushroom if its the right term for it? Can you guide. where can i take training in manila ? Sir I will communicate again. Thank you. Sir, do you have instructional videos regarding mushroom propagation & production, i am very much interested in growing mushroom. kasi po Business Administration student po kasi ako at may Feasibility Study kami about Oyster Mushroom Production, gusto ko lang po sana sa inyo magtanong ng personal kaso lang po taga Davao City po ako,at kayo lang po kasi ang alam ko na successful na sa pag cultivate at pag bi business ng mushroom especially oyster mushroom, kung okey lang po sana? hi po ate.. student po ako ngayon at ganyan dn po yung study namen. alam nyo na po ba kung ilan pinuproduce nila in one yeaar? hi. i am interested in growing tropical button mushroom. I am from Bacolod City. do you have instructional material on how to grow it? I would appreciate your help. Thank you. through our office landline number 02-5030362. Block 1 Lot 9 Luke street, Del Mundo Village, Llano Caloocan City. anu po un washed sugar? ask k0 lang p0, . nababase p0ba sa pr0cess ng cultivati0n ang kind ng mushr00m na tutubo. ? Hi Jeff, Hindi.. Bawat mushroom ay may sariling binhi o spawn na ginagamit. magkakaiba ng cultivation process ng bawat mushroom na gusto mong i cultivate. We would like to inform your good office that we are planning to visit your company to conduct a case study as a requirement for our course subject entitled agricultural commodity sytem. As much, may we request to you a copy of your company profile as an attachment in the recommendation letter of our group. We hope your positive reponse thank you very much and more power. please inquire to 09475876070 po for more details... salamat po. Any seminar po this June? Sir may available po ba kayo na fruiting bag na ready to plant? Sir may seminar po ba kayo sa davao? Or anyone you know na nag pa pa seminar ng mushroom production sa davao? metro manila lang po ang training namin... please contact 09475876070 for details. Thank you! hELLO PO. MERON PO BANG TRaining center sa cavite? hello po! nagbebenta po ba kayo ng ganoderma fruiting body? Hi po! Kailan po ang next training schedule? Do you already have a seminar training date for 2017. Kindly leave leave contact number for inquiries concerning details. hi po.. tanong lang po para sa thesisi namen.. tanong klang po kung ilan napo ang market demand ng mushroom? Saan po kami pudeng maginquire para sa next training any contact pleaase? Good afternoon, I just want to ask if what you do to the roots of the mushroom after the mushroom is harvested? This question is for my research and it will be a great help for me. Thank you so much. Do you still hold seminars/trainings on cultivating and growing mushroom? I'd love to know where and when. Thank you! hi, paano po ang market ng mushroom?may maoofer poba kayong market ng mushroom? Hi good am po ask ko po kung may pa semnar kayo dito sa bacolod & how much?